Water Maze's reinforced, pre-fabricated, fiberglass pits serve as an economical oil-water separator as well as provide an ideal method of capturing water generated by pressure washing. The 3-stage collection pit is designed with baffles with the middle chamber perfectly sized to receive Water Maze's proprietary oil-coalescing plates for enhanced separation. The fiberglass separator is significantly easier and less expensive to ship and install than shipping or constructing a concrete connection pit. The reinforced fiberglass sidewalls prevent bowing and movement. 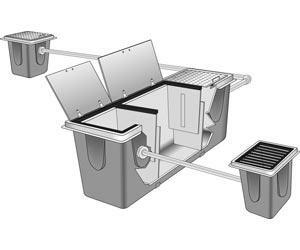 The fiberglass collection pit works best when combined with a catch basin and sump pit, which are both made of chemical-resistant, reinforced fiberglass.